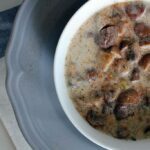 This amazing mushroom soup recipe totally isn’t mine. I have to give all the props to this one to Kevin’s mom. Dawn is such a fantastic cook, and she’s never shy to try something new, or different. I can’t count the number of times we’ve been over for dinner and when asked what’s for dinner, she’d giggle and tell us we were guinea pigs for a new recipe. This soup, that I totally ripped off from Dawn, then made my own, is NOT! This soup reminded me that sometimes the food gods smile on me too. And sometimes, not only do they smile, they clap with glee! I am trending towards a more plant based diet these days, and I decided to make this soup 100% vegan and I’m so happy it did! We’ve had the dairy version, and this weekend I served up this vegan option and it passed the Kevin test, Kevin’s dad loved it, Zenen loved it, and I thought it was great. Bet you didn’t know, mushrooms are the highest non-animal derived source of vitamin D! Mushrooms have a pretty good protein content, and are high in both iron and selenium. This freaky fungus has been used for it’s medicinal properties for hundreds of years, and have been at the centre of medical breakthroughs such as drugs for the treatment of high cholesterol. This pungent root has also been used for medicinal purposes for centuries. Garlic is filled with flavonoids and sulfur-containing nutrients that boost your immunity, and can be considered to be a cleansing food as sulfur promotes the elimination of toxins from the body. In a large, heavy bottomed pot melt the coconut oil. Add onions and celery, and cook over low heat until tender and transparent. Add quartered mushrooms and minced garlic to pot. Saute, stirring frequently until mushrooms cook down and become soft - about 10 minutes. Add vegetable broth, coconut milk, salt and pepper, and bay leaves. In a small bowl or cup, mix cornstarch with a few tbsp of water, creating a slurry. Stir the cornstarch slurry into the soup to thicken the broth. Add sherry, starting with 1/4 cup, and add more if desired! Sprinkle nutmeg over soup and stir well to combine. Simmer uncovered, for 10 minutes. If desired, garnish with a sprinkle of nutmeg just before serving.